Product information "Shimano Dura Ace Groupset 9100 2x11-Speed"
The DURA-ACE Group is the result of the boundless passion of SHIMANO for technology. This is expressed in each individual component of the group. All parts are coordinated so that they function as a whole and complement each other to provide unparalleled performance. In this way the DURA-ACE achieves the highest perfection. The 11-speed DURA-ACE rear derailleur has been equipped with low-friction, polymer-coated cables for easier, faster operation. This new rear derailleur is also equipped for direct mounting, which provides a stiffer base for improved shifting and minimizes the likelihood of damage to the frame due to collisions. The derailleur cable guide has also been adapted to further reduce the force effect during shifting. The precise and simple adjustment of the derailleur offers more pulling options and an integrated adjustment of the tension. The R9100 series provides optimum power transmission. This is achieved by their wider HOLLOWTECH II arm and a reinforced outer chainring at their unique asymmetric spider construction with four arms. In terms of stiffness and lightness, the new R9100 cranks meet the highest standards. The R9100 rim brakes with its light twin-pivot brake caliper provides maximum recision for better control and more reliability in the race. The rim brake is easy to adjust and maintain thanks to easy tool access and the possibility of changing the wheel quickly. 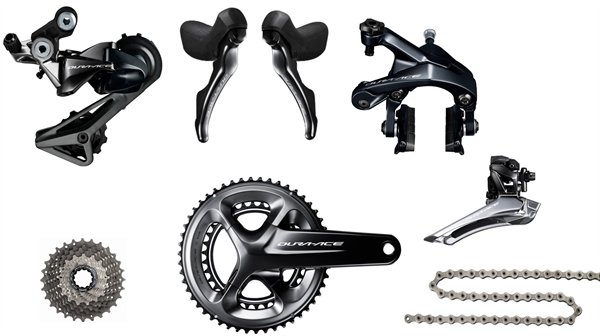 Related links to "Shimano Dura Ace Groupset 9100 2x11-Speed"
Customer evaluation for "Shimano Dura Ace Groupset 9100 2x11-Speed"